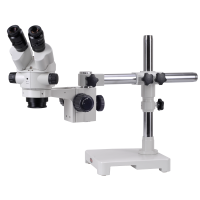 The Omano OM1030 is our most economical stereo microscope body and has proved popular over ten years. 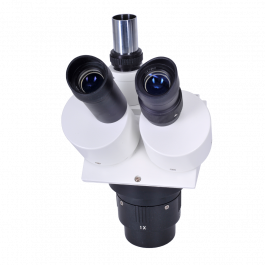 It includes 1X/3X dual power objectives and WF10X eyepieces for total magnification of 10X/30X. Each eyepiece includes a diopter for individual eye focusing and the interpupillary adjustment range is 55-75mm. Rubber eyecups are included. The effective working distance is 3.75" without an auxiliary barlow lens. Optional barlow lenses are available in 0.3x, 0.5x, 0.75x, 1.0x and 2.0x powers. 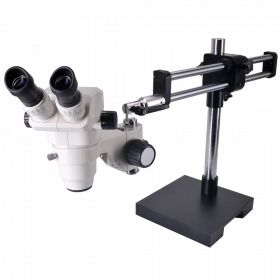 The Omano OM1030-T is our most economical trinocular stereo microscope body and has proved popular over ten years. 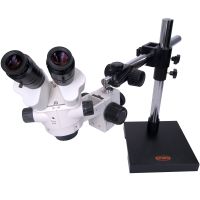 It includes 1X/3X dual power objectives and WF10X eyepieces for total magnification of 10X/30X. Each eyepiece includes a diopter for individual eye focusing and the interpupillary adjustment range is 55-75mm. Rubber eyecups are included. The effective working distance is 3.75" without an auxiliary barlow lens. Optional barlow lenses are available in 0.3x, 0.5x, 0.75x, 1.0x and 2.0x powers. A 23mm trinocular adapter for eyepiece cameras is included. ,br /> Lifetime Limited Warranty. 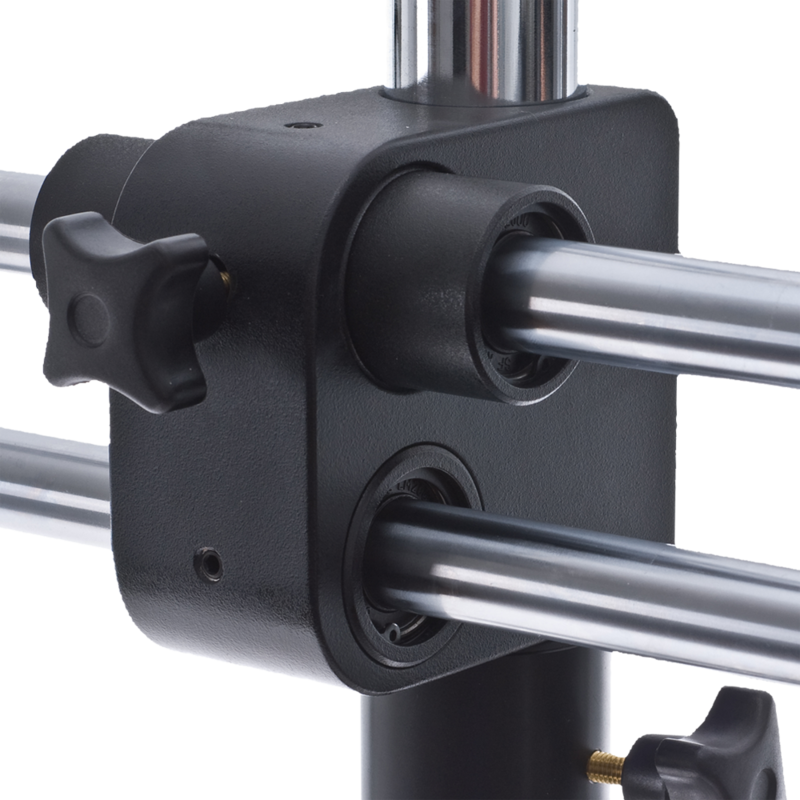 The V15 is our premium stand, characterized by 'continuous glide', ball-bearing motion for effortless repositioning,perfect for electronics and circuit board inspection. The boom has dual horizontal arms of solid metal alloy and measures 28 inches when extended (including the hanging bar). It also includes several thoughtful features not seen on comparable products. 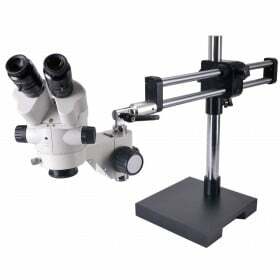 A solid metal hanging bar bracket allows unlimited tilting angles of the microscope head. 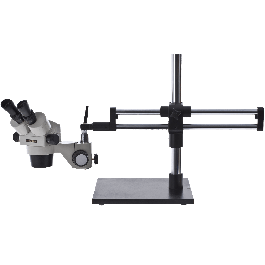 The counter-weight is mounted with a rubber back stop to protect the bearing housing.A neat, spring-loaded adjustment lever on the hanging bar enables the lever to be moved out of the way without releasing the pre-set position of the microscope head. The V15 boom stand provides up to 13 inches of vertical working space and also comes with a U-clamp configuration to mount on a work bench. The overall build-quality and solid steel construction will provide a lifetime of dependable performance. Note: Microscope and focus block sold separately. 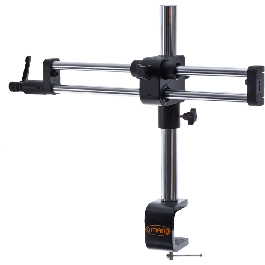 The V15 boom stand provides up to 13 inches of vertical working space and includes a heavy-duty C-clamp capable of securly mounting to work surfaces up to 2.5 inches thick. 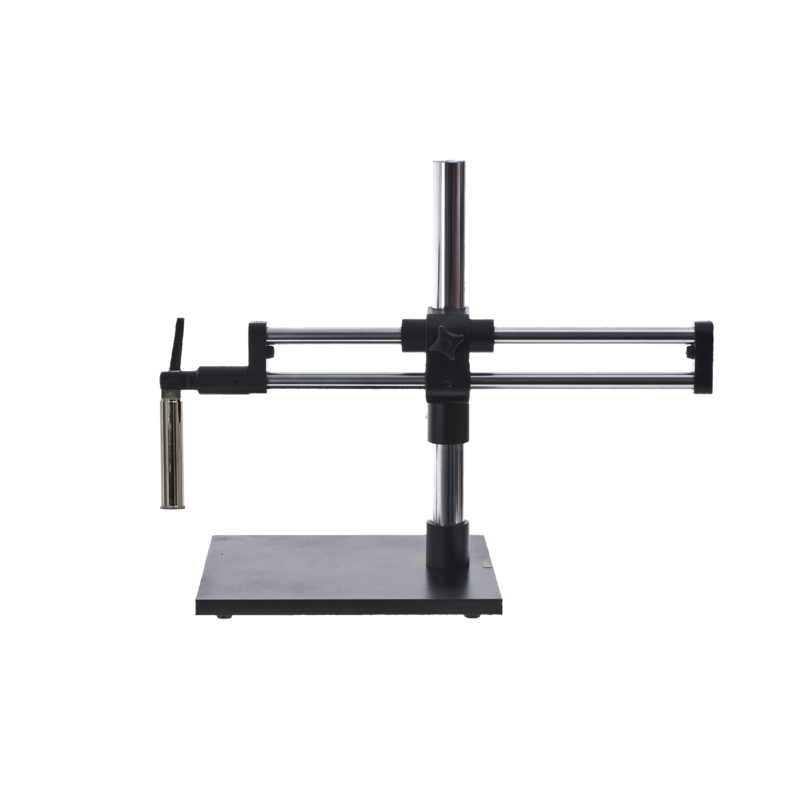 The boom stand can also be configured with a base plate to rest on top of a workbench. The overall build-quality and solid steel construction will provide a lifetime of dependable performance. 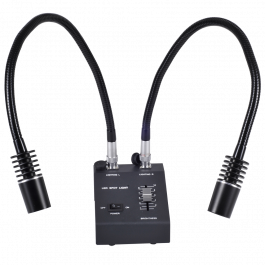 The new Omano dual gooseneck 3W LED microscope light provides excellent value with a focused spotlight and the convenience of a small footprint. The light fits easily on to a desk top and with with two 23.75 inch (60mm) gooseneck light guides, can be angled to suit your specific requirements. 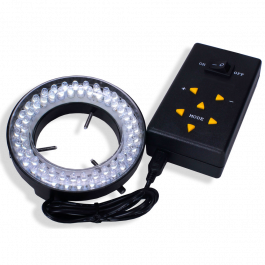 Each gooseneck offers 3W output for very bright, shadow-free illumination. 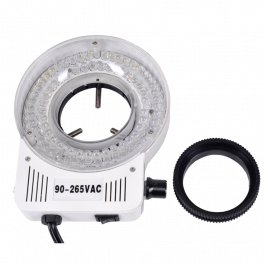 The lamp housing is made of aluminum alloy and incorporates a dimmer switch on the front for different light intensities. 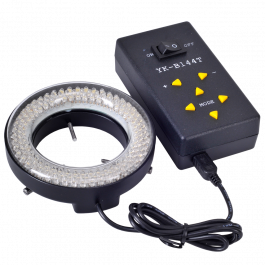 The light has an automatic voltage converter through 90-265V, 50-60HZ and operates at 3,200k. 6-month warranty. 0.3X Barlow Lens For OM2300 Series Stereo microscopes. 0.3X Barlow Lens For OM2300 Series microscope. Product is identical to .75X model shown. 0.5X Barlow Lens For OM2300 Series Microscopes. Product is identical to .75x model shown. 0.75X Barlow Lens For OM2300 Series stereo microscopes. 0.75X Barlow Lens For OM2300 Series stereo microscopes. Product is identical to .75x model shown. 1.0X Protective Barlow For OM2300 Series stereo microscopes. 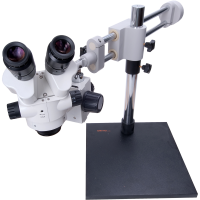 1.0X Protective Barlow For OM2300 Series stereo microscopes. Product is identical to .75x model shown. 2.0X Barlow Lens For OM2300 Series stereo microscopes. 2.0X Barlow Lens For OM2300 Series stereo microscopes. Product is identical to .75x model shown. On-camera control consists of a switch on the back (Off/USB/WiFi) which places the unit into USB or WiFi mode. After downloading the App, it is a process of connecting your mobile device to the Kopa network in the WiFi settings on your device. Occasionally, we have found that making the actual connection can take a couple of tries (typically due to other networks on the same channel), but beyond that the network is refreshingly reliable. The antenna is internally-located for security and to optimize the WiFi signal performance in industrial environments. WiFi camera, 0.5X C-mount adapter, 30.0mm & 30.5mm collars, USB cable, software CD. Camera dimensions: 90mm Width x 78mm Height x 67mm depth. 0.61 Lbs. Shipping weight - 2.0 Lbs. 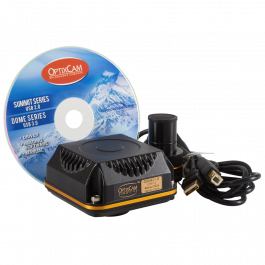 The new OCS-HDMI1 high-definition CMOS color microscope camera is a professionally-designed, imaging solution offering sharp, 3.0MP USB image capture or 1280 x 720P HDMI video @ 30Fps in a cost-effective package. 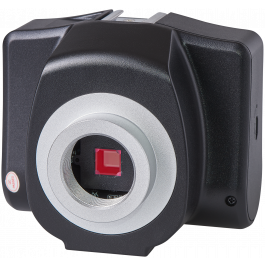 The camera offers the option of direct streaming to an HDMI monitor without the complexity of computer software, making it an ideal imaging solution for fast-paced industrial environments and technical training classrooms. HDMI (High-Definition Multimedia Interface) technology brings a number of key benefits to digital microscopy, including richer color definition, better signal integrity, greater bandwidth capacity, encryption protocols and high-definition video. The OCS-HDMI1 offers this technology in an affordable and versatile package for the PCB auditor, industrial inspection line or clinical teaching laboratory. The OCS-HDMI1 is specifically designed to enhance the Omano line of stereo inspection systems, with a standard C-mount interface which will accept any C-mount adapter. Improved functionality includes on-camera controls with intuitive, menu-driven buttons for power, pan up and down, zoom in and out, image save or video record (to optional SD card), and Auto White Balance on/off. In addition, a large focus knob at the top of the camera offers fine image focus adjustment. 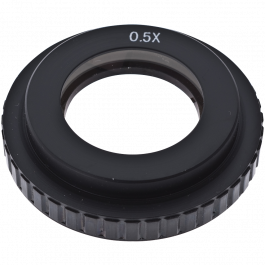 A 0.37X reducing adapter (not included) is required to mate the camera with any Omano 23mm smooth bore microscope eyeport or trinocular tube. The camera has fast white balance correction, excellent color reproduction and USB Image capture resolution of 3.0 MP, or HDMI video capture resolution of 1280 x 720P @ 30 fps. The OCS-HDMI1 quickly reacts to changing lighting conditions in any life science, clinical or material application, sending a sharp video output to an HDMI monitor. A Micro-SD card memory slot offers additional output options and storage capacity (SD card not included). Accessories include USB cable, HDMI cable, software CD. 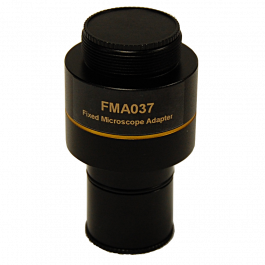 This economical 0.37X focusing adapter will mount the Optixcam SK2 or SK3 series digital camera to any microscope with a 23.2mm smooth bore eyetube or trinocular port. It is optimized to project a clear flat-field image onto a 1/3 inch sensor. 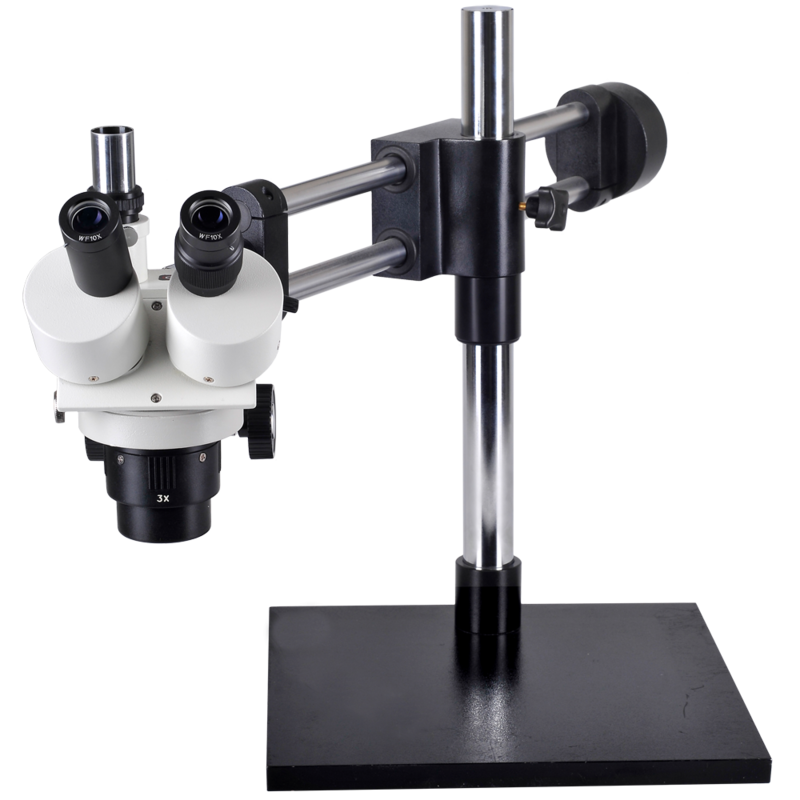 The Omano OM1030-V15 is another economical addition to our dual-power Omano boom microscope lineup. 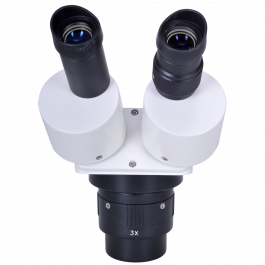 Designed for industrial inspection applications, it is available in either binocular or trinocular configuration and offers 10x/30x magnification. The V15 is our premium dual-arm boom stand that has been a proven workhorse for over ten years. Ring illumination is included. Lifetime Limited Warranty. 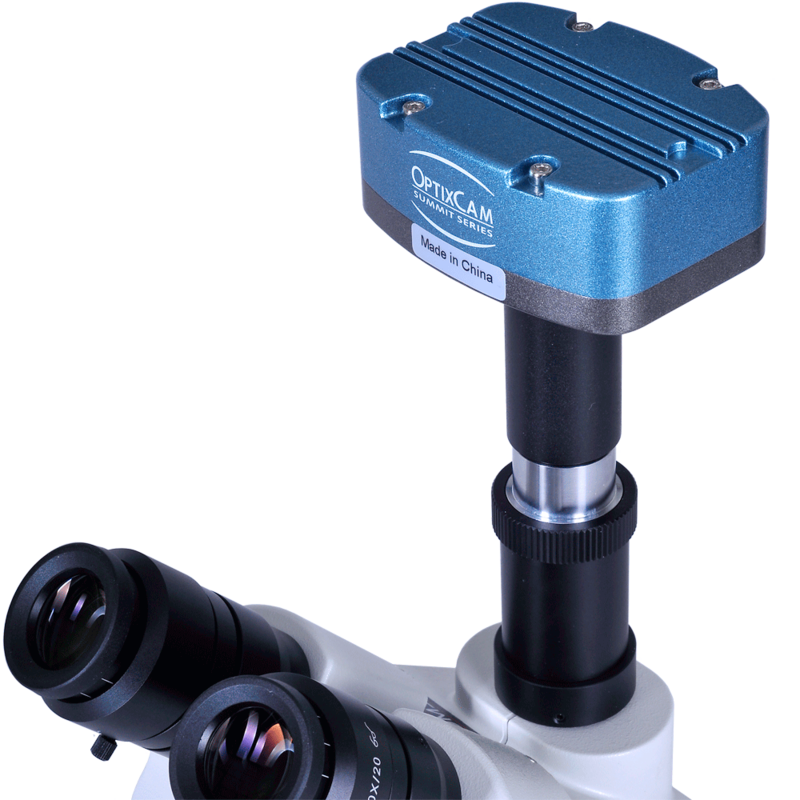 The Omano OM1030 is our most economical stereo microscope body and has proved popular over ten years. 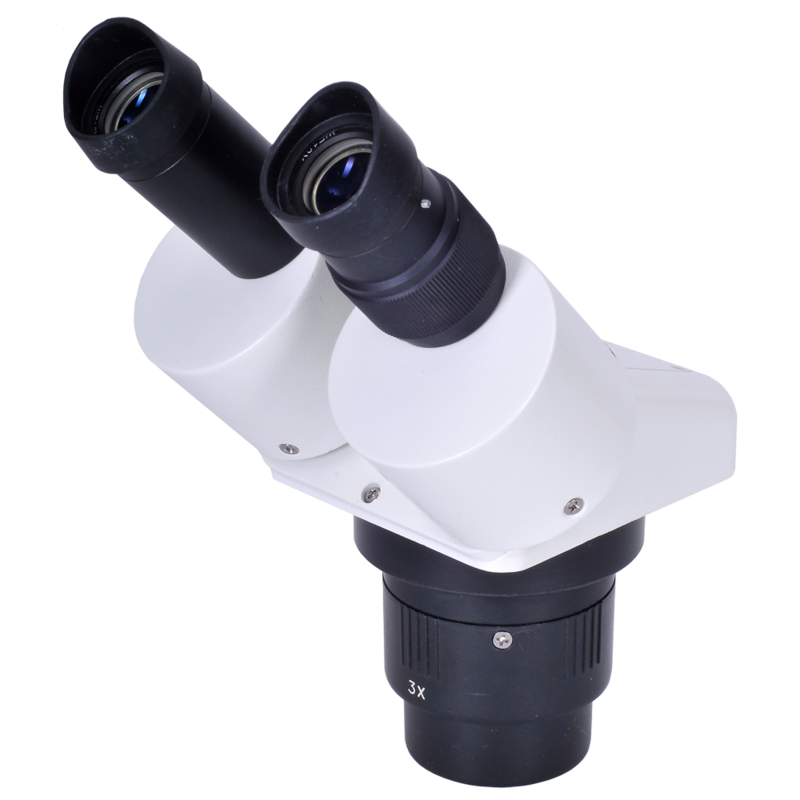 It includes 1X/3X dual power objectives and WF10X eyepieces for total magnification of 10X/30X. Each eyepiece includes a diopter for individual eye focusing and the interpupillary adjustment range is 55-75mm. Rubber eyecups are included. The head is available in both binocular and trinocular formats and a 23mm trinocular adapter for eyepiece cameras is included with the trinocular version. The effective working distance is 3.75" without an auxiliary barlow lens. Optional barlow lenses are available in 0.3x, 0.5x, 0.75x, 1.0x and 2.0x powers. Lifetime Limited Warranty. Solid steel, 21.5" tall, a horizontal span of 28" and 48 lbs - yet surprisingly graceful in its movements, the V15 is the premium Omano dual arm boom stand. Customers love it! A continuous-gliding ball-bearing slide enables fingertip positioning control while a raft of thoughtful features help earn its well-deserved reputation. A hanging bar offers versatile viewing positions, a safety collar locks the boom in place on the pole, and a rubber backstop protects the cross bar. In addition, a neat spring-loaded hanging bar bracket lever can be re-positioned without losing tension on the microscope head. They all add up to a product that feels right and works very well. Also available with a U-clamp for attachment to a benchtop. The clamp fits benches up to 2.5" thick. 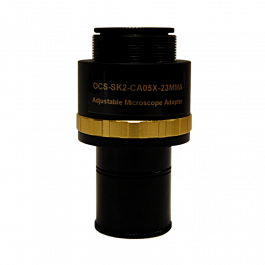 Note: The NH1080 and CX3 require the OCS-SK2-CA037X C-mount adapter to connect to this Omano microscope.